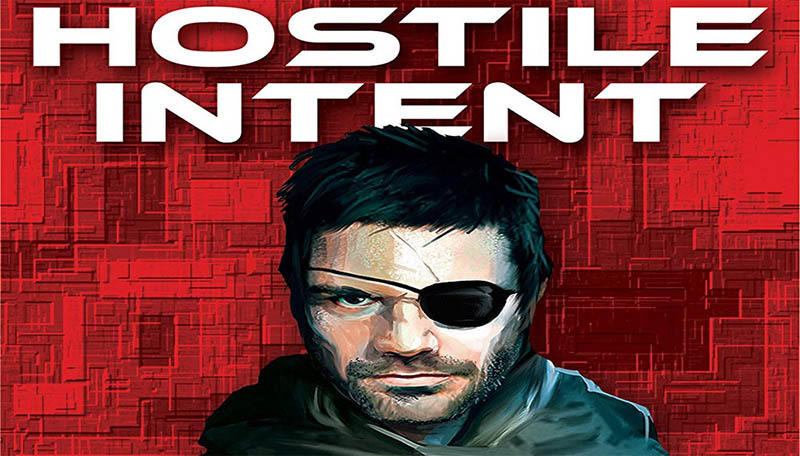 Hostile Intent is an expansion for The Resistance consisting of several different module rules. A copy of The Resistance is required to play these expansion modules. How you play and win The Resistance remains the same as the base game except for the changes outlined in each of the various module sections. Modules can be combined, though it is recommended that you play each module separately (and without the Plot Cards) before combining them. In this module both the resistance and spies must identify a specific individual among the opposing team to win. The spy Hunter reveals themselves after the third failed mission and has to correctly Accuse the resistance Chief to secure the win. Likewise, the resistance Hunter reveals themselves after the third successful mission and has to Accuse the spy Chief in order to secure the win. Select the tableau corresponding to the number of players. Place the tableau in the center of the play area with the Score Markers, Team Tokens, Mission Cards and Investigator token. Place the Round Marker on the tableaus 1st Mission space. Give each player a set of Vote Tokens. Randomly select a Leader; the Leader receives the Leader token. For games of 5 or 6 players, place two Hunter Module Loyalty cards (Chief and Not a Chief) adjacent to the scoring tableau. For games with 7 or more players, place three Hunter Module Loyalty cards (spy Chief, resistance Chief and Not a Chief) and the Hunter Mission Cards (Chief Fail) adjacent to the scoring tableau. 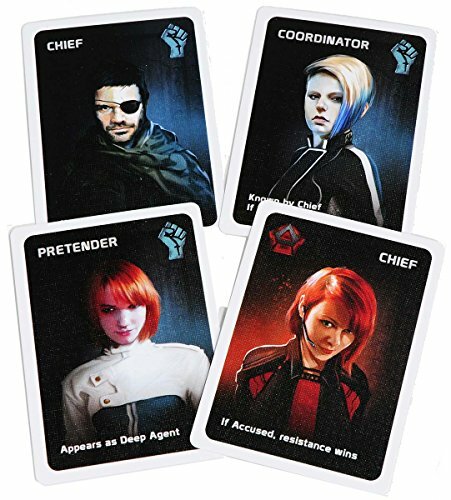 Start with the following four Character cards: resistance Chief, resistance Hunter, spy Chief, spy Hunter - using the remaining resistance/spy Character cards as determined by the player count. For games of 8 (or more) players, use the second resistance Chief so that there are two resistance Chiefs in play. For games of 10 players, use the second spy Chief card so that there are two spy Chiefs in play. Shuffle the appropriate Character cards and deal one card to each player. Each player secretly looks at the role assigned to them. "Everyone close your eyes and extend your hand into a fist in front of you"
"Spy Chiefs) - extend your thumb"
"Spies open your eyes and look around to see your fellow Spies and your Chief"
"Everyone close your eyes and put your thumbs down"
"All players should have their eyes closed and hands in a fist in front of them"
"Resistance Chiefs open your eyes; you should see the other Chief"
"Resistance Chief close your eyes"
During the Team Assignment (before the Team Vote), the Leader gives the Investigator token to a player (other than himself) not on the Mission Team. If the Mission Team is approved, that player is now the Investigator if the Mission fails. Note: this step is skipped on the 5 th mission; there is never an Investigation on the 5th mission. For games with 7 or more players: The Leader passes a set of three Mission cards (Success, Fail, Chief Fail) to each Mission Team member. The Chief can only play a Success or Chief Fail card - they are not allowed to play Fail. Only the spy Chief may play the Chief Fail card. The mission fails if either one (or more) Fail and/or Chief Fail cards have been played, except the 4th mission which requires two (or more) Fail and/or Chief Fail cards. Note: this rule does not happen in games with 5 or 6 players. The Chief Fail cards are not use at that player count, instead the Chief uses the regular Fail card. Early End Game Trigger: The spy Hunter can attempt to take down the resistance Chief and end the game early when the spy Chief fails a mission. Note: Any Early End Game Accusation must be made before the Investigation Phase starts. 5 or 6 players: If a mission has a Fail card played by the spy Chief, the spy Hunter may reveal themselves and make an Accusation (see below). The spy Hunter will know that the spy Chief played the Fail. 7 or more players: If a mission has at least one Chief Fail card played, the spy Hunter may reveal themselves and make an Accusation (see below). Note: the 4th mission requires that the mission fails and a Chief Fail card is played to trigger the Early End Game Accusation. Early End Game Accusation: If the Accused is the resistance Chief, the spies have won. If the Accused is not the resistance Chief, the mission results are reversed - the failure turns into a success (flip over the Score marker to indicate the change) and play continues as normal except that everyone now knows the spy Hunter. Note: If the Early End Game Accusation is incorrect it could result in the third successful Mission. In this case the normal Accusation rules apply - the resistance Hunter must Accuse the spy Chief to win, a false Accusation reverses the mission once again to be a failure. Note: the Investigation phase is delayed if Early End Game Accusation is made. If the mission is successful, the Leader will Investigate any player (other than himself). If the mission is a failure, the Investigator will Investigate any player (other then himself). Note: the Investigation phase is delayed if it is either the third successful mission or the third failed mission. In this case proceed immediately to the Accusation phase, returning to the Investigation if the Accusation is incorrect. 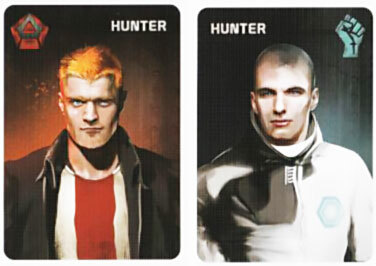 The player under Investigation is given the Hunter Loyalty cards, then selects the card that corresponds to their Character card and hands that card to the Investigator. 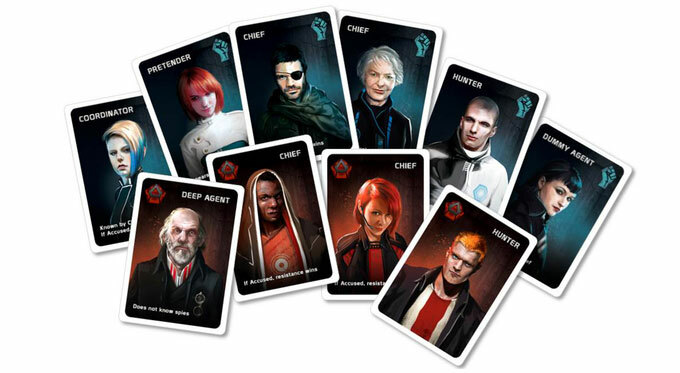 The resistance Chief must show the Chief (5 or 6 players) or resistance Chief (7 or more players) Loyalty card. The spy Chief must show the Chief or spy Chief card. All other players must show the Not a Chief card. The Investigator can discuss the information gained but may never show cards to the other players. Loyalty cards are returned and shuffled together before play resumes. Immediately after the third successful mission the resistance Hunter reveals themselves. The resistance Hunter must Accuse another player of being the spy Chief - the Accused must answer honestly, but does not reveal their Character card if falsely Accused. If the Accused is the spy Chief, the resistance has won. If the Accused is not the spy Chief, the mission results are reversed - the success turns into failure. Flip over the Score marker to indicate the change. Complete the Investigation phase and then play continues as normal except that everyone now knows the resistance Hunter. Immediately after the third failed mission the spy Hunter reveals themselves. The spy Hunter must Accuse another player of being the resistance Chief - the Accused must answer honestly, but does not reveal their Character card if falsely Accused. If the Accused is the resistance Chief, the spies have won. If the Accused is not the resistance Chief, the mission results are reversed - the failure turns into a success. Flip over the Score marker to indicate the change. Complete the Investigation phase and then play continues as normal except that everyone now knows the spy Hunter. After the 5th mission, a false Accusation will result in the other team being given a chance to make an Accusation. Repeat the Accusation process above; a correct Accusation results in a team win while an incorrect Accusation repeats the process, alternating between teams until a team wins. If the Hunter Module is combined with any variant that reveals Character cards, use the Inquisitor Loyalty Cards instead of passing Character cards: a spy must pass the spy Loyalty card, resistance players must pass the resistance Loyalty card. Additional Characters with specials powers are available to play this module. It is best to add one special Character card into a game at a time adding more or changing when you are familiar with how they play. If Investigated, the resistance Dummy Agent may show the Chief (5 or 6 players) or resistance Chief Loyalty card (7 or more players). If Accused, the Accusation is false as the Dummy Agent is not the resistance Chief. "Resistance Chief(s) open your eyes. Coordinator raise your thumb"
"Resistance Chief(s) close your eyes, Coordinator thumbs down"
The Deep Agent doesn't know the other spies, but the other spies will know the Deep Agent. "Spy Chief(s), Deep Agent and Pretender - extend your thumb"
"All Spies, but not the Deep Agent open your eyes" - the spy Chiefs have thumbs up and eyes open. At any time during Team Building phase prior to voting, the Deep Agent may Blame the Pretender. The Deep Agent reveals themselves and must Blame another player of being the Pretender. The Blamed must answer honestly, but does not reveal their Character card if falsely Blamed. If the Blamed is the Pretender, the Deep Agent and Pretender 9 switch Character cards (and allegiances). If the Blamed is not the Pretender, then play continues as normal except that everyone now knows the Deep Agent. Blame can only happen once in a game. The Inquisitor token is an optional player ability. The player with the Inquisitor will be able to look at the affiliation of another player. Unlike some other character powers, the player that has this ability is open information. Note: the Inquisitor is best saved for games of 7 or more people. At the beginning of the game, give the Inquisitor token to the player on the Leaders right. Immediately after the 2nd, 3rd and 4th mission is resolved, the player with the Inquisitor token will choose one player to examine. The player being examined passes their Character card to the Inquisitor. The Inquisitor may discuss but cannot reveal the Character card passed. The player being examined receives the Inquisitor token. The Inquisitor will only be used three times in the game. A player that used the Inquisitor cannot have the Inquisitor used on them. Example: feremiah (spy) starts the game to the Leader's right and receives the Inquisitor token. The first mission ends in success, the second mission is a failure, feremiah, as the Inquisitor, chooses Don (resistance) to examine. Don passes his Character card to feremiah. Jeremiah looks at the resistance card and proclaims "Don is a spy'". - an outright lie! Don is outraged and quickly rebuts "I never trusted you feremiah and now I know you are a liar and a spy", feremiah passes the Inquisitor token to Don. 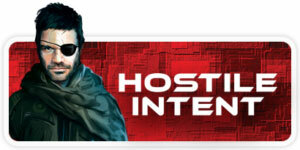 Don will be able to examine another player's Character card after the third mission is resolved. Don cannot use the Inquisitor on Jeremiah. Reversers have the ability to change the results of any mission - in the hands of the resistance this can make a doomed mission succeed, or turn certain victory into defeat. 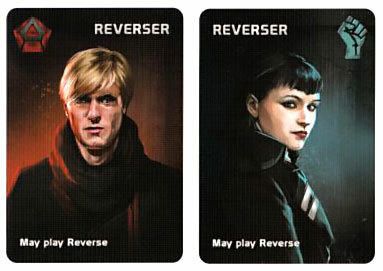 Start with either, or both of these Character cards: resistance Reverser and/or spy Reverser - using the remaining resistance/ spy Character cards as determined by the player count. Place the Reverse Mission cards adjacent to the Score Tableau. During the Conduct the Mission phase the Leader passes a set of three Mission cards (Success, Fail, Reverse) to each Mission Team member. Only the Reverser(s) may play a Mission Reverse card. The spy Reverser may only play Success, or Reverse - he may not play Fail. The mission is successful only if all the Cards revealed are Mission Success cards and either none or both Reverse cards. The mission is also successful if one (or more) Mission Fail cards have been played with one Reverse card. The mission fails if one (or more) Mission Fail cards have been played and either none or both Reverse cards. The Mission also fails if all the Cards revealed are Mission Success cards and one Reverse card. Example: a four member mission reveals Success, Success, Fail, Reverse. The mission is a success. If the Reverser Module is combined with any variant that reveals Character cards, use the Inquisitor Loyalty Cards instead of passing Character cards: a spy must pass the spy Loyalty card, resistance players must pass the resistance Loyalty card. The spy Reverser does not reveal themselves in the Spies Reveal phase.